This is a 5 inch teddy bear ornament dressed in a nutcracker soldier's outfit..
Goodman The Soldier Ornament is a 5 inch bear that wears a Nutcracker soldier's outfit and is made of the finest gold-colored mohair. His hand-tailored red jacket has many tiny details and also has a red ribbon ornament hanger. 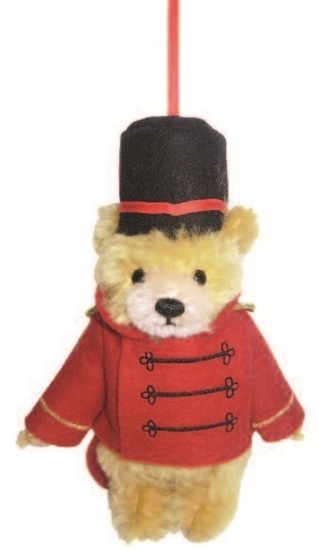 Goodman The Soldier Ornament comes with the famous Steiff Bears 'Button in Ear' ear tag and is from a worldwide limited edtion of 1500 pieces.